5.1 Earthquake hits the Babuyan Islands region in the Philippines. 5.0 Earthquake hits the Babuyan Islands region in the Philippines. Tropical Cyclone Christine is currently located 150 kilometres west southwest of Port Hedland and 50 kilometres east southeast of Karratha and moving southwest at 16 kilometres per hour. A red alert has been issued for people in Kimberley and Pilbara region of Western Australia following the Tropical Cyclone Christine. All ports have been closed, stopping iron ore exports in the resource-rich region. Tropical Cyclone Bejisa is active in the South Indian Ocean, approximately 250 miles (400 km) east-northeast of Madagascar. Over the next days, Bejisa is forecast to track to the south-southeast and slowly strengthen, becoming Category 2 storm strength on the SSHWS by Wednesday 1 January. Bejisa is forecast to track approximately 55 mi (88 km) to the east of Reunion Island (population ~840,000) on Friday 3 January as a Category 2 storm. Ten states reported widespread flu activity this week, mostly in the Southeast, but flu is now fanning across the rest of the nation, according to the weekly report issued by the Centers for Disease Control and Prevention. And it’s a once-familiar strain — the H1N1 virus that plagued the country in 2008-09. “It’s our old swine flu friend and it’s causing over 95 percent of the cases,” said Dr. William Schaffner, infectious disease specialist at Vanderbilt University. Cleveland (Aleutian Islands, Alaska): Small, brief explosions were detected at the volcano yesterday evening (21:29 UTC or 12:29 AKST) and this morning at 4:06 UTC (19:06 AKST local time), USGS reported. San Miguel volcano (El Salvador): The new eruption that occurred at the volcano Sunday (29 Dec) morning at 10:50 am local time has so far been an isolated single explosion of vulcanian type (accumulated pressure ejecting the plug in the conduit). Current seismic activity is low, but more activity could follow. The explosion produced an ash plume of considerable (3-8 km) height, reaching estimated altitudes of 5-10 km. Heavy ash fall followed the eruption in nearby areas downwind, such as in the towns of Chinameca and San Jorge to the west. Civil Protection immediately began to evacuate families residing in a radius of 3 km around the volcano. So far, more than 5000 persons have been ordered to evacuate. 5.5 Earthquake hits New Ireland, Papua New Guinea. 5.0 Earthquake hits southern Italy. Tropical cyclone Christine is located approximately 45 nm west of Port Hedland, Australia, tracking south-southwestward at 10 knots. Christine is expected to make imminent landfall approximately 195 nm east of Learmonth. After landfall, remnants of tc Christine will accelerate southeastward and rapidly erode then dissipate due to land interaction. Tropical cyclone (tc) 06s (bejisa), located approximately 620 nm north-northwest of La Reunion, has intensified and tracked southward at 05 knots moving away from land. Rain, snow and floods hit Mexico – Almost five days of heavy rain has caused floods and landslides across the southern state of Tabasco this weekend. An emergency alert has been issued for an out-of-control bushfire burning near homes on the NSW north coast burning in the Lennox Head area near Byron Bay Road and Tobin Close. The fire was being pushed by high winds really quickly towards the threatened homes. Residents were being asked to vacate their homes. Etna (Sicily, Italy): The 21st paroxysm at the New SE crater is in progress, but has still to reach its climax. At the moment, violent continuous strombolian explosions or low pulsating lava fountains occur at the summit vent and a lava flow has started to issue from the fissure vent on the SE flank of the cone. San Miguel (El Salvador): A new eruption began at the volcano this morning at 10:50 am local time. A strong vulcanian-type explosion produced an ash plume of unknown but considerable (several km) height. 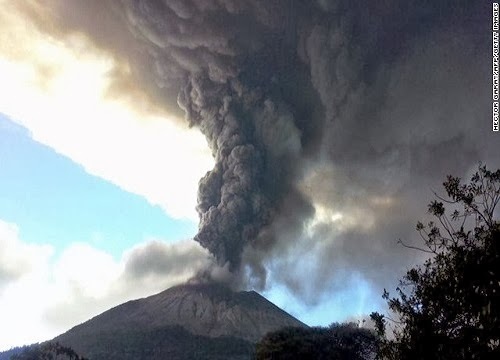 According to local press, ash fall was expected in the town of Chinameca and Civil Protection has begun evacuations of families residing in a radius of 3 km around the volcano. 5.9 Earthquake hits western Turkey. 5.9 Earthquake hits north of Ascension Island. Tropical cyclone Christine is located approximately 202 nm north-northeast of Port Hedland, Australia and has tracked southwestward at 06 knots. Christine is expected to continue tracking southwestward around the south towards Port Hedland before recurving southeastward, making landfall approximately 225 nm east of Learmonth, After landfall, remnants of tc Christine will gradually erode due to land interaction and dissipate. Tropical cyclone (tc) 06s (six), has formed in the southern Indian Oceans and is located approximately 685 nm north-northwest of La Reunion, the storm has tracked southeastward at 04 knots and is expected to behave erratically over the next days. El Hierro (Canary Islands, Spain): No new earthquakes occurred since yesterday. The seismic signals at all stations at the same time show a slight increase in what might be weak tremor or wind and ocean-wave noise. The latest GPS deformation measurements show that some new inflation and NE displacement occurred in the northern parts of the island (HI01, HI00 and FRON stations). Suwanose-jima (Tokara Islands, Japan): Bright glow from intense strombolian activity, or perhaps even the presence of a small lava lake or lava fountains, are visible on the JMA webcam on Nakanoshima island to the NE. VAAC Tokyo reports continuous low-level ash emissions. Sinabung (Sumatra, Indonesia): (28 Dec) VSI confirmed that a new lava dome (a mass of viscous magma accumulating at the vent) has made its appearance on the northern crater of the volcano. It had a height of 56 meters and diameter of 105 meters on 26 Dec. Its volume was estimated to about 1 million cu meters, and the growth rate at 3.5 m3/second. A major risk posed by the dome will be block-and-ash (pyroclastic) flows caused by collapse of the instable mass, once it surpasses the rims of its crater. Another hazard, often related to the previous, are explosions of trapped pressurized gas. Whether the new lava dome will produce such potentially large explosions, will depend on how gas-rich the currently erupting magma is and how effective degassing through fissures, cracks etc. works. But most similar eruptions have almost always included significant explosive activity at some point and extreme caution should be taken around the volcano. In particular, all valleys radiating from the summit area should be avoided at all times. VSI recommends not to approach the volcano within 5 km radius (which in the case of a larger pyroclastic flow is not sufficient at all) and more than 17,000 people from about 20 villages remain evacuated. 5.4 Earthquake hits the Canary Islands (El Hierro). 5.3 Earthquake hits the Canary Islands (El Hierro). Tropical cyclone (tc) 05s (five), located approximately 306 nm north-northeast of Port Hedland, Australia, has tracked south-southwestward. Maximum sustained surface winds were estimated at 35 knots gusting to 45 knots. A cyclone warning has been issued for coastal areas of Western Australia, with Bureau of Meteorology forecasters expecting a tropical low off the coast of Broome to strengthen over the weekend into a category 3 storm. Heavy rain and gusts of up to 100 kilometres per hour are expected to hit the WA coast between Kuri Bay and Broome this afternoon and further extend to De Grey north of Port Hedland by Sunday morning. Wild weather on the Canary Islands has claimed the lives of at least two people including an 11-year-old girl who were drowned when they were swept away by waves on La Graciosa Island. The toll from heavy rains and flooding in Brazil’s southeast states of Espirito Santo and Minas Gerais climbed to 45, authorities said. El Hierro volcano (Canary Islands): The situation has been calm over night after yesterday’s M5.1 earthquake off to the west. Except abundant rockfalls and smaller landslides, the quake has not caused major damage or injuries, fortunately. Some local roads in the El Golfo area near steep cliffs have been closed. On the island itself, the signs of volcanic unrest have decreased since yesterday afternoon: tremor, still present, has decreased in strength, earthquakes have been mostly absent under the central/SE part of the island, and deformation seems to be stagnating. Whether this is a pause or sign of the near end of the current crisis is too early to say. IGN also lists the earthquake now, as a magnitude 5.1 event at 15 km depth NW off the island, i.e. on the western rift zone axis.